Satellite images have been used to support humanitarian efforts for decades. Why? A bird’s eye view of a disaster-affected area simply captures far more information than most Earth-based data-collection technologies can. In short, birds have more situational awareness than we do. In contrast to satellites, UAVs offer significantly higher-resolution imagery, are unobstructed by clouds, can be captured more quickly, by more groups and more often at a fraction of the cost with far fewer licensing and data-sharing restrictions than satellite imagery. There are basically three types of UAVs: 1) the balloon/kite variety; 2) fixed-wing UAVs; 3) rotary-wing UAVs. While my forthcoming book looks at humanitarian applications of each type, I’ll focus on fixed-wing and rotary-wing UAVs here since these are of greatest interest to humanitarian organizations. These types of UAVs differ from traditional remote control planes and helicopters because they are programmable and intelligent. UAVs can be programmed to take-off, fly and land completely autonomously, for example. They often include intelligent flight stabilization features that adapt for changing wind speeds and other weather-related conditions. They also have a number of built-in fail-safe mechanisms; some of the newer UAVs even include automated collision avoidance systems. Fixed-wing UAVs like senseFly’s eBees (above) are launched by hand and can land on a wide variety of surfaces, requiring only a few meters of landing space. They fly autonomously along pre-programmed routes and also land themselves auto-matically. My colleague Adam from senseFly recently flew eBees to support recovery efforts in the Philippines following Typhoon Yolanda. Adam is also on the Advisory Board of the Humanitarian UAV Network (UAViators). Other fixed-wing UAVs are flown manually and require an airstrip for both manual take-off and landing. Rotary-wing UAVs, in contrast, are “helicopters” with three or more propellors. Quadcopters, for example, have four propellors, like the Huginn X1 below, which my colleague Liam Dawson, another Advisory Board member, flew following Typhoon Yolanda in the Philippines. One advantage of rotary-UAVs is that they take-off and land vertically. They can also hover in one fixed place and can also be programmed to fly over designated points. Rotary-UAVs cannot glide like their fixed-wing counterparts, which means their batteries get used up fairly quickly. So they can’t stay airborne for very long (~25 minutes, 2 kilometer range, depending on the model) compared to fixed-wing UAVs like the eBee (~45 minutes, 3 kilometers). Advisory Board member Shane Coughlan is designing fixed-wing humanitarian UAVs that will have a range of several hundred kilometers. Fixed-wing UAVs, however, cannot hover in one place over time. So both types of UAVs come with their advantages and disadvantages. Most UAV experts agree that fixed-wing and rotary-wing UAVs can serve complementary purposes, however. You can quickly use a quadcopter to do an initial aerial recon and then send a fixed-wing UAV for more detailed, high-resolution imagery capture. So what are some specific examples of humanitarian UAVs in action? Lets take the response to Typhoon Yolanda, which saw an unprecedented number of UAVs in operation. Rotary-wing UAVs were used to support search and rescue efforts, looking for survivors amongst massive fields of debris left behind by the unprecedented storm surge (see below). More specifically, Liam captured very high-resolution imagery of large debris-riddled areas that could not be reached by car and then analyzed this imagery for any signs of trapped survivors. Most of this imagery was taken with an oblique, high-resolution camera; oblique simply means that the camera was not pointing straight down but an angle. These cameras can be set to capture continuous very high-resolution (VHR) video footage or to take VHR photographs multiple times a second or minute. Some cameras like GoPros can do both. (In the US, the majority of search and rescue operations supported by UAVs use the fixed-wing kind like the Spectra which use down-facing vertical cameras. Advisory Board member Gene Robinson is one of the leading experts in UAV search & rescue missions in North America). Rotary-wing UAVs were also used in the wake of Yolanda to help clear roads. Again, very high-resolution (oblique) aerial imagery was used to determine which roads to prioritize for clearance and what equipment would be needed to clear said-roads given the widely varying levels of debris. In the same way, aerial imagery was also used to identify sites for humanitarian organizations to set up their base-camps. 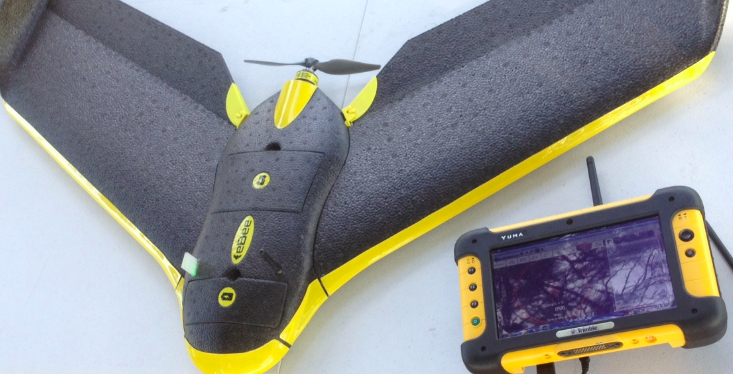 Fixed-wing UAVs like the eBee were used to survey disaster damage in Tacloban, with the resulting imagery uploaded to Humanitarian OpenStreetMap’s (HOT’s) Task Manager to trace up-to-date digital maps of the area. This is not the first time that HOT has used aerial imagery—the team used aerial imagery back in 2010 following the devastating Haiti earthquake. Beyond building damage, VHR aerial imagery can also be used to assess the impact of a disasters on powerlines, cell phone towers, agriculture and farmland. In addition, VHR images can also be used to estimate populations and the number of displaced persons. In Haiti, the International Organization for Migration (IOM) used UAVs used to map over 40 square kilometers of dense urban territory, which included several shantytowns. The imagery was used to count the number of tents and to organize a “door-to-door” census of the population–an important step to identify needs and organize more permanent infrastructure. A few months after Yolanda, the Swiss humanitarian organization Medair used fixed-wing UAVs to support their post-disaster recovery operations. They took hundreds of VHR aerial photographs to create very detailed 2D and 3D digital maps of Tacloban and Leyte. This required flying the UAV at the same altitude along a pre-programmed route. The UAV team that captured the images used the Pix4D software to stitch these together and create the 3D maps, which capture elevation—an important piece of information for disaster-risk analysis like floods and storm surges. The VHR maps enabled Medair to identify and thus advocate for those residential areas that were falling behind vis-a-vis reconstruction and recovery. 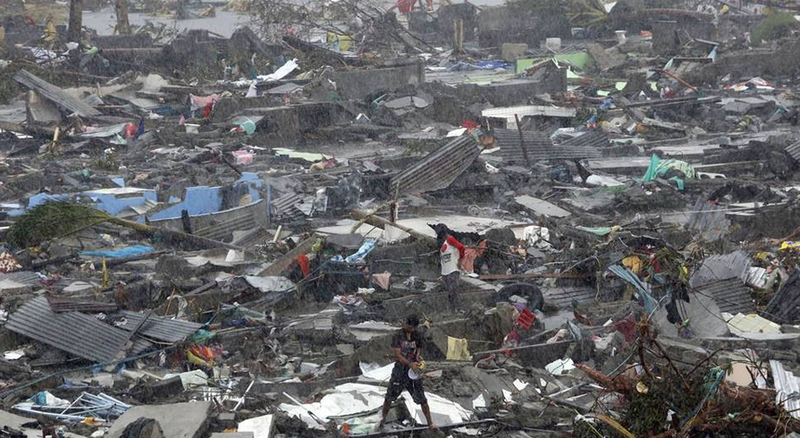 The imagery was also used by the local mayor’s office in Tacloban to identify appropriate, safe and dignified areas to resettle Filipinos had been forced to live in informal shelters right after the Typhoon. To learn more about past and ongoing humanitarian UAV projects, please see the “Directory of Projects” on the Humanitarian UAV Network. If you know of other projects that are not listed in this directory, then please do add these directly to the document, thank you. There’s been increasing talk of using UAVs for transportation (small payloads of 1-5 Kilos). Perhaps these payloads could carry flyers with important information for disaster-affected communities who are without electricity, radio access or cell phone coverage. Along those lines, some entrepreneurial groups in the US are starting to use UAVs for advertising purposes by flying banners. This may be another way to “communicate” with disaster affected communities, although it would be limited to one-way communication. Obviously, payloads could also include satellite phones or first-aid kits, like the one below, which we were testing earlier this week for our upcoming UAV Search & Rescue Challenge. In addition, Google and Facebook are betting hundreds of millions of dollars that UAVs will provide remote areas with Internet connectivity (as is DARPA). This may come in handy when traditional communication infrastructure is affected after major disasters. Some telecommunications companies may follow in these footsteps; sending out a fleet of UAVs to serve as temporary “aerial cell phone towers” when their Earth-based towers go down. A related idea is to extend the concept of meshed mobile communication technologies (like those developed by The Serval Project) to aerial meshed communication networks. 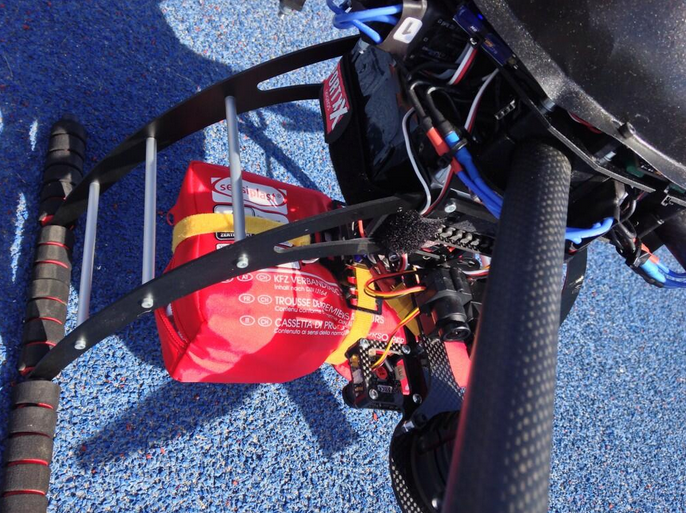 UAVs can also carry a host of sensors other than a regular camera. In Haiti, UAV sensors were used to assess water quality and identify areas of standing water where mosquitos and epidemics could thrive. Highly sensitive audio sensors can be used to listen for signs of trapped survivors. Other sensors can also be used to identify whether radio transmitters and other ground-based communication facilities (like cell phone towers) still work. This use-case was brought to my attention earlier this year by a member of the UAViators Advisory Board. UAVs can add value in a number of areas but are obviously not the solution to every problem. In many cases, the use of UAVs won’t be appropriate; and when all you have is a hammer, then everything looks like a nail. So my advocacy around the use of humanitarian UAVs should obviously not be taken to suggest that UAVs are the answer to every and all humanitarian problems; UAVs, like other technologies used in humanitarian settings, obviously come with a host of advantages and disadvantages. As always, the key is to accurately identify and describe the challenge first; and then to assess potential technology solutions that are most appropriate—if any. Finally, and again obviously, flying UAVs is just part of the challenge. Coordination, safety, privacy, information sharing, imagery analysis, legislation and operational response are just a some of the other challenges that the Humanitarian UAV Network is set up to address. This entry was posted in Drones/UAVs, Humanitarian Technologies and tagged drones, Fixed-Wing, Rotary-Wing, UAVs. Bookmark the permalink. These UAVs also have great applications in refugee and humanitarian crises for war zones. In Syria, with use of Geographic Information Systems (GIS), you could actually plan out entire refugee camps through the use of drones. This was a really great application and thank you for sharing! A lot discussions about UAVs and Drones focus on military usage, especially with the U.S. military in Pakistan and Yemen. However, this article addresses the humanitarian use of drones in disaster areas, specifically in the Philippines after Tyhoon Yolanda. If you want a basic introduction to humanitarian drone use, read this! Introduzione all’utilizzo dei droni per scopi umanitari. Patrick is an internationally recognized expert and consultant on humanitarian technology and innovation. Book: Digital Humanitarians. Previously: UN, World Bank, Harvard Humanitarian Initiative, Ushahidi. PhD from Fletcher School, Pre-Doctoral Fellow at Stanford and MA at Columbia. Born & raised in Africa. Could These Swimming Robots Help Local Communities?